Be assured, tapping into conversations with Generation Z will spark big ideas! The world is changing and Generation Z holds the key to a future that understands modern technology, entrepreneurship and diversity better than anyone. While young people today might be less politically engaged than expected, they are environmentally and socially conscious, less materialistic, more community-minded and less cynical compared to previous generations. Generation Z wants to change the world; fame and fortune isn’t top-most on their agenda but having a positive impact on the world is. Because life affords us with choices, we can either steer our boat into calm waters, paralyzed by fear and complacency, or we can purposely make waves, by taking risks, daring to be different, challenging convention, so that we may raise the sails and soar in the breeze! My book, Go Ahead, Rock the Boat: Conversations with Generation Z, tells of five teenage friends find themselves at odds with their families, culture and social standing. They find solace within their group. Their choices are shaped by changes within the global economy and exposure to cultural diversity, rapid technological development, and the difficulty of cultivating dependable relationships. The friends nurture the hopes, ideals, and positive qualities in each other, ideals that grow in response to the state of the world economy, the spread of technologies, and generally the turbulent times in which we live. Together they travel to Israel to embark on a one-month working holiday at a Kibbutz. Here they find a meaningful and consistent home with socially and environmentally responsible values. They yearn for work that allows the worker to feel like they are contributing to something bigger than themselves. The group tests their friendship and evolved sentiments relevant to global social ills affecting mankind and their generation through conversations, by exploring diverse viewpoints. Their search is for new ways to learn from today to better prepare for the future, to increase tolerance and decrease materialism, parallel to evoking justifiable critical thinking about authority and government. But there is much more at play here than just creating boundaries between old and new philosophies: in deciphering the enmeshed friendship bond within the troupe, the intention is to engender a metamorphic and ground-breaking leap of mindsets. The biggest lesson in life remains―if you fail, get up, dust yourself off and try again. Generation Z is our future and will be taking this world into unknown and uncharted territories―be prepared! 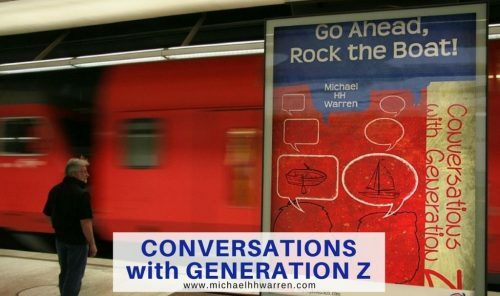 Read Go Ahead Rock the Boat: Conversations with Generation Z on Amazon.